With more than 20 years of experience on Elbrus and nearly 100% summit success, Alpine Ascents’ expertise in logistics and guides makes for an unsurpassed program. This has been an Alpine Ascents classic trip since the early 90’s. While travel to Russia can be cumbersome with many logistical hurdles, we take great care to preplan the small details, giving you and our expert guides (Ben Jones and Carole Tejas are scheduled to lead our 2019 climbs) an excellent chance to reach the summit of Europe’s highest peaks. Providing extra summit days, all-inclusive, multiple reservations at the High Camp hut, an excellent staff of Russian guides, and a keen sense of how to care for our climbers helps us bridge the gap from daunting task to well-executed journey. Our 2018 season was simply stellar with 95% success and fantastic post trip evaluations. Truly one of Alpine Ascents signature programs. Where others have scaled back, we strive to keep the integrity of the program such as using the Heart of Elbrus Lodge as opposed to the huts and barrels. The Lodge provides far superior lodging and bedding than nearby accommodations, for all mountain days. Unlike other outfitters who may rush you in and out of Russia, we take the time to properly acclimatize and to visit the grand cities of Moscow and St. Petersburg. Dynamic in both region and terrain, Mt. Elbrus stands as a watchtower between the great masses of Europe and Asia. Elbrus is a large, double-coned volcano whose twin summits vary by about 65 ft.
Our Elbrus program is open to any climber who has successfully completed a Mt. Rainier climb, or a similar program (prior climb on glaciers). This journey begins with acclimatization along well-traveled trails, which wind endlessly through the foothills of the Caucasus. En route, we interact with the local people as we wander through the villages and markets that pepper the mountain’s lower region. Once we have established High Camp, we prepare for an early morning departure to the West Summit (the higher of the twin peaks). The route ascends 1,000 m of moderate snow climbing to the saddle. From there, we turn west and head up 300 m of steeper terrain, finally reaching the summit plateau. 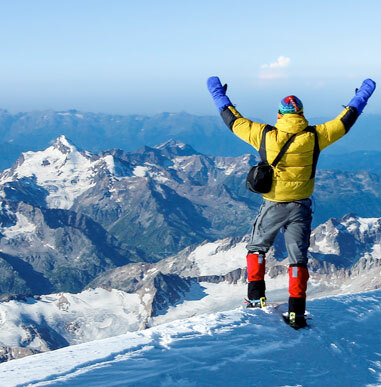 See Day-to-Day Itinerary Elbrus is the near-perfect ascent for aspiring climbers who wish to test their skills at increasing altitude. Although only basic mountaineering skills are required, high altitude and unpredictable weather make this a challenging and enticing ascent. Take a look at our Cybercast to view past years and some of the delights of this trip. 2018: Led by Vern and Carole Tejas, we saw 95% success between the two teams. 2017: Led by Vern and Carole Tejas, we saw 97% success between the two teams. 2016: Led by Vern and Carole Tejas, we saw 96% success between the two teams. 2015: Nearly 90% success with Vern and Carole Tejas leading our teams. 2014: Both of our teams summited with a success rate of 100%, led by Willie Benegas. 2013: Both our teams summited, with a success rate of over 90% in a year in which a number of teams did not reach the summit. We attribute this to our expert guide and our extended itinerary, which allowed us a second summit attempt when weather turned bad on the first summit attempt. Our flexibility and ability to reserve multiple days at High Camp, rebook the Sno-Cats, etc., were vital in giving Team 2 a chance to summit. 2012: Proved to be a spectacular year, with our three full teams reaching the summit under the leadership of Vern Tejas, assisted by Carole Tejas. We returned to the south side and the mountain proved to be in great condition for all climbs. We had three outstanding groups and, as always, we are happy to put you in touch with previous year’s team members for their stories. Climbers should have successfully completed our 6 Day, 8 Day, 9 Day, 10 Day, 12 Day, or 13 Day training courses, or have equivalent skills and experience. Those who had a strong performance on a 3 Day Baker or Rainier climb may also join. We expect climbers to have basic skills on snow and ice, self-arrest, crevasse rescue, and glacier travel. The snow and ice slopes that we will deal with are moderate (up to 45 degrees). The requirements are also based on our desire to have similarly skilled team members. Elbrus’ surroundings provide a look into the cultures of the Turkish, Georgian, Azerbaydzhani, and Russian people. Our expedition begins in Moscow, the focal point of commerce and politics in Russia. Markets and state shops dominate Moscow’s street life. Depending on schedules, we may take time to visit the Kremlin, stroll at Red Square and along the Moscow River, visit the Russian Orthodox Cathedral of Christ the Reedemer and tour the famous Novodevichy Cemetery. Following our climb, we return via St. Petersburg, a traditional vanguard of European culture. It is one of the few cities in the world that has retained its charm amidst change. Downtown sprawls with exquisite architecture that canopies streets of shops, small restaurants, and an active nightlife scene. This mighty mountain range links the Caspian Sea to the Black Sea and creates the natural boundary between the steppes of Russia and the southern states of Azerbaydzhani, Georgia, and Armenia. Mt. Elbrus, the pinnacle of this 700-mile stretch, has long been a distinguished climbing center for the European and Russian climbing communities. Elbrus can easily be seen from most of the high passes in the area and is a traditional climb for those looking to ascend above 18,500 ft. The Caucasus (or Kavkaz meaning “more than mountains”), offers excellent climbing and skiing terrain to the outdoor enthusiast. Ancient people of the region called the mountain Strobilus and believed it to be the location where Prometheus was chained. Also called Elborus, the origin of the name is unknown. British Grove expedition with Akia Sottaev. 1874. Elbrus was first attempted in 1829. Akia Sottaev initially climbed the lower east peak. Almost 40 years later, in 1868, Sottaev was hired to be part of a summit attempt with British explorer, Douglas Freshfield. In 1874, six years after the unsuccessful attempt with Freshfield, Sottaev summited with the Grove expedition. He was the first person to summit both peaks and was 86 years old at the time. All US citizens are required to have a visa before arriving in Russia. We will mail all applications and letter of invitation to you, and you do not need to do anything until you receive this package (about 60 days before departure). You will need to obtain your visa well in advance of the climb, either from our travel agent (see flight info above) or directly from a Russian Embassy or consulate. Before obtaining a visa, a letter of invitation from Russia must accompany your application. We will contact you with information on how to obtain a visa. Upon sign up we will forward our famed, comprehensive confirmation package. This package will include all of the details for your trip. What is the skill level of this climb? Climbers should have successfully completed one of our training courses, such as: Cascades 6 Day, Alaska or Rainier 8 Day, Alaska 12 Day, or Cascades 13 Day, or have equivalent skills and experience. Those who had a strong performance on a 3 Day Baker or Rainier climb may also join. They must have basic knowledge of progression on snow and ice, self-arrest, crevasse rescue, and glacier travel. Climbers will deal with moderate (up to 45 degrees) snow and ice slopes. During the expedition we will spend three days on the mountain reviewing skills. The requirements are also based on our desire to have similarly skilled team members. What is the physical conditioning level needed for this climb? Very good to excellent physical condition. We spend a fair amount of time acclimatizing in the build-up to summit day, which typically is 12 hours or more of climbing. Any tips on how a climber can maximize their chances of success? Along with the required crampon skills, review cardio training on the Training page. This climb generally boasts 100% success. Different from most outfits, we send one of our leading guides from the United States as expedition leader. On summit day (and sometimes earlier) we hire numerous English speaking, highly skilled Russian guides, which keeps our summit day climber-to-guide ratios low. What is the best season to climb / which dates will have the most chance for success? June and July are the best times to climb Mt. Elbrus. Will I be sharing a tent or lodging with other climbers? Lodging for this expedition is in hotels, lodges, or hut structures while on the mountain. You will share rooms on this expedition, but you can pay a higher fee for single rooms in Moscow and St. Petersburg. How much will my pack weigh? On summit day, climbers carry approximately 25-30 lbs. but we suggest you train with 40 lbs. in your pack. Please review the Gear List. How does your gear rental system work? Those requesting rental gear must submit an expedition rental form with payment by fax or mail. All rental gear will be mailed to the climber prior to the climb. Climbers are expected to clean all rental gear and return it to us by mail following the expedition. Any further advice on gear and using your gear list? While all items are required, there may be times when some of the items on the Gear List may not be used (such as warm weather or changing conditions). The Gear Lists are created by the guides to assist in having climbers be prepared to summit in any conditions. While it is impossible for us to list all brands for certain gear, we do offer a wide variety of equipment in our Gear Shop that has been hand-picked by our staff of mountaineering experts. Please feel free to call our offices with any gear questions or substitutes. Plastic boots are required for this climb. We purchase bottled water to use on the mountain. At mealtimes, we will provide hot, boiled drinking water. What will the meals on the expedition be like? We eat in restaurants or at our hotels prior to moving to our huts on the mountain. At the huts, food is ample but very limited in variety. We are all aware of the potential monotony of expedition food and Alpine Ascents makes every effort to have meals on the climb as enjoyable as possible. We understand the importance your food and staying healthy so we are not serving packaged or dehydrated food. Here is a link to a sample menu in pdf. Can I bring some food from home? All meals will be provided on this climb. See the Gear List for snack food to bring on the climb. Are there any innoculation requirements? What is the best air route to my destination? Most routes are via Europe and thus there are many travel options. Climbers are required to arrive before 3:00 p.m. on Day 2 of the itinerary. When should I book my flight? Do I need to use your Travel Agent? Fares are generally less expensive when booked early. You may use our travel agent (Charles Mulvehill 1-800-727-2157) or book flights yourself. Please note that flights booked online are often difficult to change. Please send us a copy of your flight schedule as early as possible as this allows us to book pick ups and hotels (which are often overbooked in Russia). What time should I arrive and leave and where do I meet the guides? Your guide or an Alpine Ascents representative will meet you at the airport. Look for a large Alpine Ascents sign. What if I arrive early or depart late? Can you arrange extra night lodging? Is there a single room option for this expedition? We are happy to make arrangements such as personalized tours, extra hotels rooms, airport pickups and arrange for private rooms. Please indicate that you would like a private room on your application and we will contact you with information on single room supplement costs (for hotels only). Yes, the visa process for Russia hearkens back to a time where bureaucracy reigned as king. Upon receipt of your application or deposit, we will send detailed instruction on obtaining a visa. Is there any communication while we are on the mountain? In the cities and in hotels telephones are readily available. Our guide carries a satellite phone and will give daily updates on our website as to how the group is progressing. Where can I get more information on history, books, and additional activities in the region? Russian history is vast and there are a few books on Elbrus and the region. Check the Reading List. Can I contact the others on the climb? How about the guide? You can always call our offices and one of the Elbrus guides will contact you, generally about one month before your trip departure. Thirty days prior to departure, we mail a list of other team members to you. We recommend bringing about $1000 (in addition to credit cards) for extra expenses and tips. How much should I tip my guide and staff? 10% of the total trip costs is the suggested tip amount for all American and Russian guides together, and you may have some perfunctory tips at hotels and at time of transport. Tipping is not required but a common practice. How do I register for this expedition? At: http://www.alpineascents.com/registration, or by calling our offices with a credit card handy. What paperwork do I need to send in? Each climber should submit an Application and flight information. We accept MasterCard, Visa, American Express, personal checks and Alpine Ascents gift certificates. To reserve a space, the deposit is $700.00 and balances are due 120 days prior to departure. Unpaid balances can result in forfeiture of trip. CANCELLATION AND REFUND POLICY: Note: Alpine Ascents International highly recommends trip cancellation insurance for all programs. Due to the nature and heavy costs of government and operator permits, Alpine Ascents International must adhere to a stringent refund policy. Specific brochure cancellation and refund policies may supercede those enumerated below. Each deposit, regardless of amount, includes a $200.00 nonrefundable registration fee. All expedition balances are due 120 days prior to departure date unless otherwise specified. Full refunds, less registration fee, will be provided 90 days or more prior to departure date. 50% refunds will be provided 60-89 days prior to departure date. No refunds will be provided 59 days prior to departure date. Participants whose balances are not received by the 90-day deadline as stated above, risk forfeiture of their place on the expedition. All refund requests must be made in writing and be received in our office within the 90-day period, as stated above. What happens if I need to leave the expedition early? As our Elbrus climb travels to multiple locations, early departure may be difficult. If a climber needs to depart early, our guides will assist in obtaining the necessary transportation and reservations to get you home as quickly as possible. We also have local Russian staff at our disposal for assistance. Alpine Ascents is deeply committed to maintaining ecosystems at home and around the world. With each expedition, trek, and course, we not only attempt to leave the environment as we found it, but strive to assist the local population in protecting the land and people indigenous to that region. 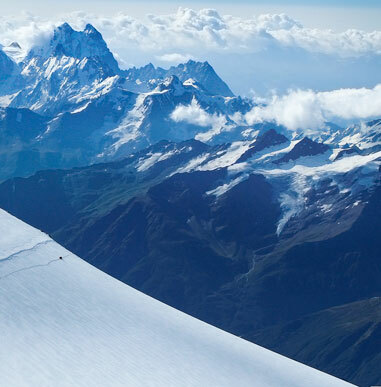 Alpine Ascents reaches for the highest ethical business practices at home and abroad. Each staff member is dedicated to environmentally sound alpine ascents. Environmental stewardship remains one of our core values, and we take Leave No Trace ethics and practices seriously. The mountains are our home and we are unwilling to sacrifice their preservation for human objectives. On every one of our courses and climbs, we teach and follow the environmentally appropriate Leave No Trace principles and practices. 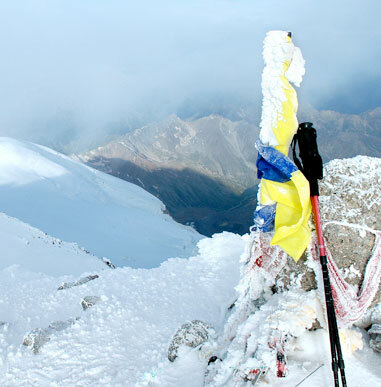 Elbrus, with its high, double-headed crown, is one of Europe’s most popular peaks. Hosting aspiring climbers from all around the world has had profound impacts on the mountain and the nearby villages. We dedicate great efforts to reduce and mitigate the negative effects of our passing through this beautiful range. Along with all of our usual procedures, (trash removal and not relying on bottled water) we go out of our way to visit the now-defunct Priut Hut. This old relic of the USSR days is a great place for our mini-seminar on environmental awareness. A discussion on prevailing attitudes of the bygone era dramatically reveals its legacy and lessons for mountaineers. The site opens our eyes to the way our actions may affect climbers for generations to come. It’s an an enlightening moment in the growth of responsible mountaineers. Our commitment to environmental stewardship can be seen on our programs around the world. Over the years, with the assistance of our Sherpa teams, we have stepped up efforts to clean Mt. Everest. Our Wag Bag® program made a pioneering step in human waste management for the National Park System and Forest Service in the North Cascades. On Aconcagua, we pioneered a waste removal system on our climbs, utilizing the WAG Bag® system. And we continue our maintenance and minimal impact plans wherever we guide. We believe that given the proper information, most people will do all they can to help protect and maintain the environment. Alpine Ascents is committed to developing safe, self-reliant and environmentally conscious mountaineers. So for me…high marks in all departments. As I told Vern and Carole, my vacation time is extremely limited and precious, and I feel like Alpine Ascents gave me an absolutely fantastic experience on all levels. Russian Orthodox Cathedrals in the Kremlin, Moscow. Cultural Museum on Red Square, Moscow. Climbers on an acclimatization hike, with Elbrus in the background. View from the new Elbrus Huts. Relaxing at the top of an acclimatization hike, Elbrus in the background. Snow Cat used to transport gear to our highest hut. Sunrise on Elbrus summit day. The last 400 feet to the summit. High on summit day with the shadow of Elbrus under the full moon. Ushba, one of the most famous mountains of the Caucasus. Celebration party after summiting Elbrus. Climbers high on summit day. Eugene and Nicolai, two of our Russian guides. Sunflower fields outside Mineral Vody, southern Russia. St. Isaacs Cathedral, St. Petersburg. The Hermitage in St. Petersburg, the greatest mueseum of Russia.